Posted on May 23, 2007 by Alicia Bay Laurel	in Blog and tagged travel diaries. It’s really true! Adorable fashion designer Aya Noguchi (on left above) made a line of clothes for Fall 2007 printed with illustrations from Living on the Earth. 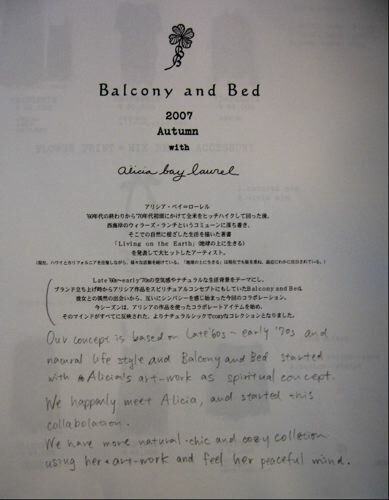 Her company, Balcony and Bed, boasts two stores in Tokyo, and she wholesales to stores throughout Japan. 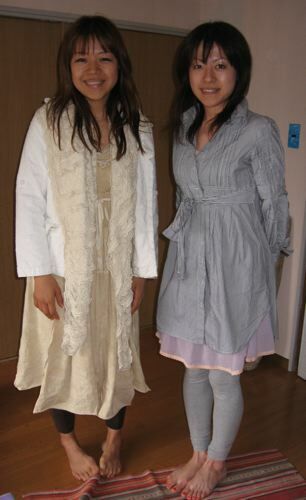 She came over to Koki and Ayako’s house with her assistant, Chihiro (to her right), bearing clothing samples. I am overwhelmed with joy. As you can see in the mission statement from her catalog (above), Aya created the line to harken back to the 1960’s and 70’s (was she even born yet then? ), so, of course, I feel quite comfortable in her clothes! I tried on a black background print wool jersey dress over my long sleeved olive green t-shirt (it’s kind of a chilly day). I love it! I think when I wear it for events, I’ll wear a black long sleeved t-shirt under it. 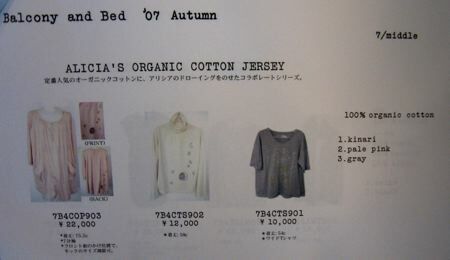 All of Aya’s wool jersey items are also available in a brown background print and a light gold background print. Here’s a closeup of the black background version of the print. 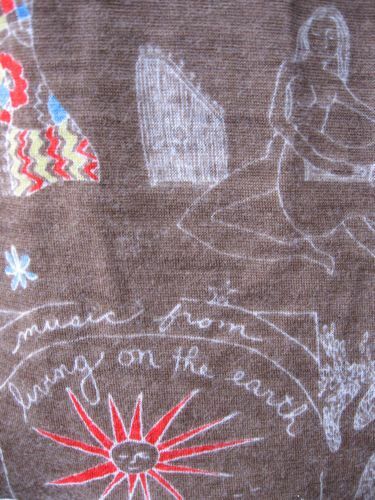 And here’s a closeup of the brown background version of the print. 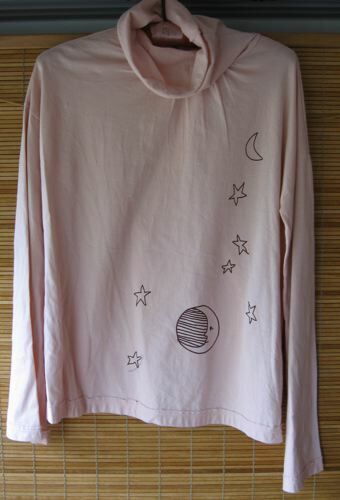 Here’s an organic cotton knit cowl collar long sleeved t-shirt. 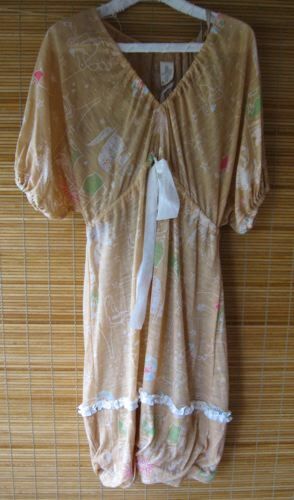 Here’s a loose fitting short dress with elasticized hem in the light gold background version of the print wool jersey. Here’s how the long dress looks in brown. 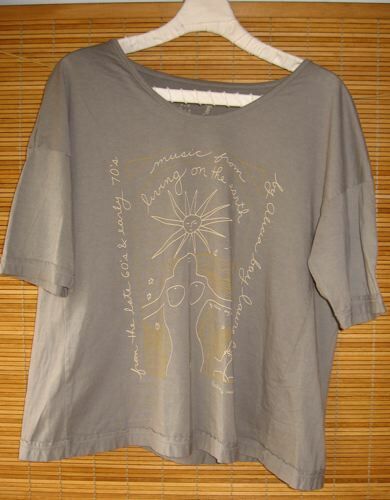 Here’s a much more feminine organic cotton Living on the Earth t-shirt. All of Aya’s organic cotton knit items are available in light gray-green, pale salmon pink, or cream. A big serged square of the printed wool jersey makes a shawl or ample neck scarf (Aya calls them “boas”). 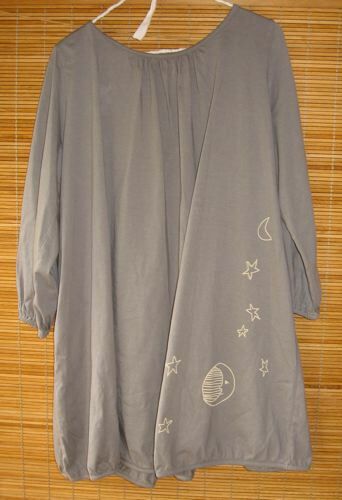 A flowing light gray-green organic cotton knit smock printed on the back with moons and stars. The front closure is asymmetrical. Aya gave me three of the samples (my choice). 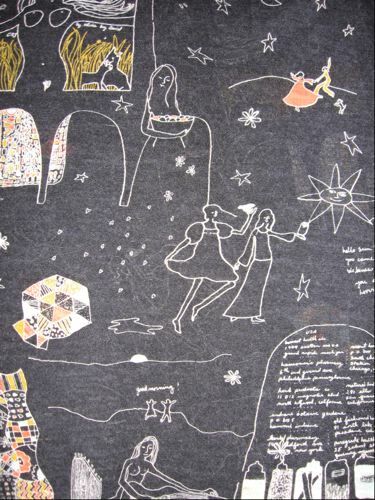 I chose a gray-green t-shirt, the black dress I’m wearing in the photo above, and a black print scarf. I’m thrilled I get to wear these during my tour. By the way, the wool jersey does NOT itch. I’ve had the scarf around my neck for four hours at this writing, and, while my skin is often irritated by wool, I am totally comfortable in this. Throughout my tour I will be distributing Aya’s posters at the tables where I sell my books and CDs, and showing her catalogue to anyone who asks. 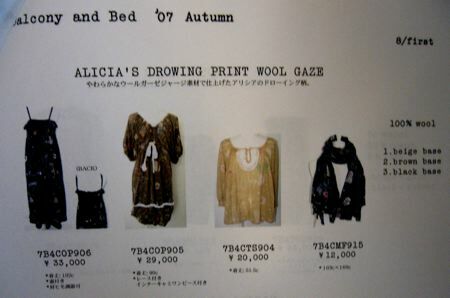 I will also be importing her clothes next fall to sell from my website and to stores in the USA. So, if you’d like me to advance order any of the clothing for you, please let me know. (To convert the prices into US dollars, go to www.xe.com.) Each piece is available in a choice of three colors, and only one size (“free size”), which should fit women size one through ten. Few Japanese women wear sizes larger than ten, and most wear size six and under, a tribute to their magnificent cuisine and natural moderation. 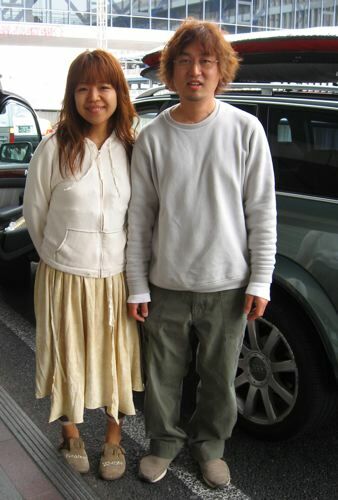 Early the next morning, Aya and her husband, Kouichi, who is also president of her company, drove me to Haneda Airport on their way to work in Tokyo. She brought me a homemade breakfast – a rice ball wrapped in nori with a bit of baked salmon inside, and a delicious tea made from roasted buckwheat (soba cha!). What sweet people! When I return to Hayama in mid-May, I will visit their home, where I’ll be interviewed by their friend who writes for Switch, an arts and culture magazine. I will wear Aya’s clothing for the photos!